It’s triple or nothing for Mayor Bloomberg in Colorado. The New York City mayor, who spent $350,000 earlier this year on the losing recall defense campaigns of Angela Giron and John Morse, is back with another big check, this time $1 million for the billion dollar tax increase campaign. Along with the check came a healthy helping of hypocrisy from Governor Hickenlooper, who publicly thanked Bloomberg only days after criticizing money from out-of-state interests. In a press release from the Yes on 66 campaign announcing the contributions, Democratic Gov. John Hickenlooper — not any of the other less prominent political advocates and business leaders supporting the campaign — offered a quote thanking the out-of-state donors. That’s noteworthy given Hickenlooper’s recent statements to national media advising national groups to stay out of Colorado politics and policy debates. 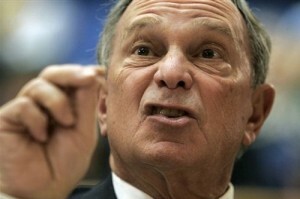 We welcome Bloomberg’s money — TV station sales managers love it and Colorado voters abhor it. Great news for everyone but the actual recipient of Bloomberg’s bucks. On Hickenlooper’s hypocrisy, however, we sure would love to see a reporter follow up, and not just for a punt from a spokesperson. Which is it Governor Hickenlooper – do you think outside influences are a good or bad thing in Colorado elections? “Well, without $10 million, the Governor and Amendment 66 supporters decided it’s losing. But for more saturation media, and most importantly a final week of browbeating infrequent but liberal voters into returning ballots, the proposal would lose. Big money is completely aligned with big government. But, wow, has the campaign behind 66 been deceptive. What is happening to our state of Colorado. This stuff used to happen elsewhere, not here! Glenn, more specifically, most of the money is going into the teacher's PERA retirement accounts that disappeared because of poor fund management. Is that the responsibility of private biz to be taxed 27% to replenish public retirement funds? Who is replenishing ours? No one but we ourselves. No one has helped small business America. Instead, they are seeking one tax after another! Katharine Teter What 66 will do is replenish the retirement funds of public workers, including teachers. Bad fund managers caused the money to disappear. The teachers paid into their own retirement funds just like we private sector folks have done with our own retirement funds. Is the public sector willing to replenish ours? Why do we need to take 27% of our business income and give it to the public sector to help replenish their retirement funds? That's wrong. The publicity around this campaign has been completely deceptive! We're getting duped once more. So disappointed by Gov. Hickenlooper. I thought he was above this type of deception. This is so disgustingly amazing that it's almost too much to believe! What is wrong with this country when big money is what buys people's agendas and not truth, common sense and hard work. Makes me sick! I voted down Amendment 66. The money gained from Amendment 64 is supposed to be earmarked for schools. Why do we need a second bill to do the same thing? And why the heck is a spending bill be added to the Constitution? It should be a regular law. I DID vote yes on AA, though, as I voted yes on 64. Oh shoot. A teacher misspelled the word "employed." Question to consider BEFORE voting on an AMENDMENT (66) to our Clorado CONSTITUTION: Why are outsiders Bloomberg and Bill and Linda Gates investing in an amendment to the constitution of COLORADO? The New York City mayor who spent $350,000 earlier this year on the losing recall defense campaigns of Angela Giron and John Morse, is back with another big check, this time $1 MILLION for the BILLION dollar tax increase campaign. TV station sales managers love it and Colorado voters abhor it. Great news for everyone but the actual recipient of Bloomberg’s bucks. How disgusting! If anyone would still try to say that CORPORATE AMERICA is not trying to take over public education, they must be living under a Boasberg rock! Bill and Melinda Gates who have been meddling in DPS with their "gifts" of millions yearly with strings you could anchor a battleship, and now this…we need to get the billionaire OLD boys club OUT OF COLORADO'S PUBLIC SCHOOLS! !